REPORT OF SON KILLED LEADS FATHER TO ENLIST. On Thursday morning (22nd April) Mr and Mrs C Fox of the Causeway received information that their son, Victor, of the Wiltshire regiment had been killed at the front. The news has not been confirmed by the War Office but was, the parents state, conveyed to them by a comrade, and the father in order, as he puts it, to avenge his sons death went at once joined Kitchener’s Army. L/Cpl Fox had proved himself a plucky lad. He was formerly with his father in the bill posting business and enlisted in the Gloucester Regiment and also the Somerset’s, but was bought out. When war broke out he again joined the Army and has been in France for some time. Mr and Mrs Fox have another son who is a prisoner in Germany and this morning’s post brought a letter from him in which he appeals to his parents to send food, in particular white bread. 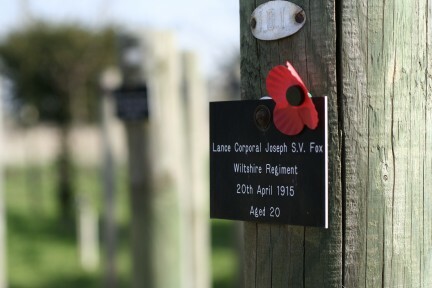 L/Cpl Fox was the second soldier from 1 Wilts to be executed during the War. Unlike the previous victim (in 1914 aged 33) Fox was a young man of 20 attached to 3 Division Cyclists Company when he deserted. He was tried during April 1915 and executed at Dickebusch on the 20th April 1915. 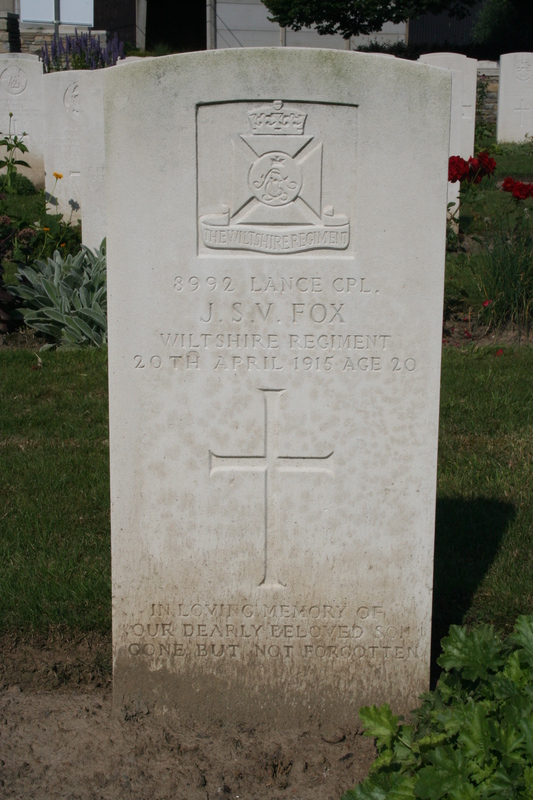 L/Cpl Fox came from Chippenham and was buried at Dickebusch New Military Cemetery, Belgium. His grave carries the inscription "In loving memory of our dearly beloved Son. Gone but not forgotten". Fox is also commemorated in Chippenham on the Parish Church Roll of Honour and on the town War Memorial, suggesting that his parents were not told the true circumstances surrounding their son’s death. At the time however, the official army policy was to inform relatives of the true cause of death, and also to specify the offence. 8992 L/Cpl JSV Fox aged 20 executed for desertion on 20 April 1915. 1 Wilts attached to 3 Div Cycle Co. Fox was a regular soldier. Both Fox's father and brother survived the war.